Adams Heating and Cooling provides humidifier installation and dehumidifier installation. They can also repair your humidifier or dehumidifier, as well as provide all the maintenance you need for these appliances in Kalamazoo, MI. Why is a dehumidifier important to have? Humid air can cause mold and mildew to grow inside homes, which pose various health risks. Very humid climates or air make some people extremely uncomfortable, causing excessive sweating that can't evaporate in the already-moisture-saturated air. It can also cause condensation that can disrupt sleeping, or prevent laundry from drying thoroughly enough to prevent mustiness. Higher humidity is also preferred by most pests, including clothes moths, fleas, cockroaches, woodlice and dust mites. For all of these reasons, controlling the amount of moisture in the air is very important for your house, and there are several versions of humidifiers and dehumidifiers that you can choose from. What types of humidifiers and dehumidifiers are there? On the humidifier side, there are point-of-use versions, which are commonly used to humidify a single room, and whole-house or furnace humidifiers, which connect to a home's HVAC system to provide humidity to the entire house. Similarly, dehumidifiers can be purchased as stand alone items for smaller areas, and they can be attached to your air conditioner to work more efficiently and with your entire house. How are humidifiers and dehumidifiers maintained? Adams can provide maintenance and repairs for your humidifiers and dehumidifiers. Recommended humidifier and dehumidifier maintenance is an annual checkup that includes cleaning the units, cleaning the filters, and analyzing / cleaning the water panel. 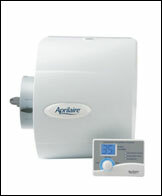 At Adams Heating and Cooling, we sell Aprilaire humidifiers and dehumidifiers. These models are excellent quality at competitive prices, and the warranties are very good. We can recommend certain models based upon the size of your home, and provide installation if its within the greater Kalamazoo area.